Quoted in, “Facebook is Trying to Hire News Credibility Specialists.” Business Insider, June 8, 2018. Cited in, “The Supreme Court and Sharia law: How a fake-news story spreads.” Politico, May 14, 2018. Research Cited in, “Digitization, Digitalization, and Digital Transformation: Confuse Them at Your Peril.” Forbes. April 29, 2018. Research Cited in, “Facebook Embeds Could Break Campaign Finance Law.” Politico, April 25, 2018. Research cited in, “Was Facebook’s Work with the Trump Campaign Illegal.” Slate. April 11, 2018. Quoted in, “Will Trump Change America’s Relationship With Political Privacy.” The Washington Post. March 31, 2018. Featured in, “What the Cambridge Analytica Story is Really About.” FiveThirtyEight. March 30, 2018. Featured in, “Cambridge Analytica Scandal Raises New Ethical Questions About Microtargeting.” NPR. March 22, 2018. Featured in, “What Did Cambridge Analytica Do During the 2016 Election?” NPR. March 20, 2018. Quoted in, “Florida Student Passes NRA in Twitter Followers.” Politico. February 27, 2018. Cited in, “Eight questions Congress could ask Facebook.” CNN. November 1, 2017. Cited in, “Silicon Valley helped Russia sway the US election. So now what?” The Guardian. October 29, 2017. “Here’s What White Supremacy Looks and Sounds Like Now. (Hint: It’s Not Your Grandfather’s KKK. )” with Kelsey Mason. The Monkey Cage, The Washington Post. August 17, 2017. Quoted in, “Obama Alums Pour $1.5 million into Progressive Tech Startups.” Wired. August 2, 2017. Quoted in, “Facebook Won’t Reveal Data about Campaign Ads.” Reuters, June 22, 2017. Cited in, “How Big Data Mines Personal Info to Craft Fake News and Manipulate Voters.” Newsweek, June 8, 2017. The New York Times. February 24, 2017. Authored piece, “Trump, Breitbart, and the Rejection of Multi-Cultural Democracy.” Vox. January 30, 2017. A Trump campaign will only increase the Democrats’ advantage in data and analytics, The Monkey Cage, The Washington Post, May 20, 2016. Bernie Sanders, Digital Opportunities, and Networked Political Participation, UCLA Digital Cultures Lab, February 15, 2016. Back Into the Breach: Sanders, Clinton, and the Democratic Party’s Data, Cyborgology, February 29, 2016. The Democratic Advantage in Digital, Data, and Analytics Isn’t Going Away Easily, The Monkey Cage, The Washington Post, May 13, 2015. The Real Story About How the Romney and Obama Campaigns Used Twitter, The Monkey Cage, The Washington Post, December 9, 2014. Featured in, “Dean and Buchanan – The Flamethrowers.” The Contenders. Aired on PBS on 9/21/2016. Produced by OZY. Quoted in, “Generation Gap: Can Clinton and Trump Reach Millenials.” Roll Call, September 20, 2016. Quoted in, “Clinton’s End-Run Around the Press.” The Atlantic, August 17, 2016. Featured in, “The Communicators with Daniel Kreiss.” C-Span. Air date, August 16, 2016. Quoted in, “Trump’s Twitter Army.” Politico, June 16, 2016. Quoted in, “Skeptical of Tech, Donald Trump Rejects Big Data’s Role in Politics.” NPR All Things Considered, May 31, 2016. Quoted in, “Profiting from Politics Proves Challenging for Startups.” The Wall Street Journal. May 25, 2016. Authored piece, “A Trump campaign will only increase the Democrats’ advantage in data and analytics”, The Monkey Cage, The Washington Post, May 20, 2016. Quoted in, “Inside Bernie Sanders’ Vast, Virtual Ground Game.” Politico. April 11, 2016. Quoted in, “Tech’s Big Play in 2016.” The Hill. March 13, 2016. Quoted in, “What Google and Twitter Can Tell us About 2016.” Time. February 22, 2016. Featured in, “A History of Data in American Politics (Part 3): The 2016 Primaries.” fivethirtyeight.com. June 30, 2016. Featured in, “A History of Data in American Politics (Part 2): Obama 2008 to the Present.” fivethirtyeight.com. January 21, 2016. Featured in, “A History Of Data In American Politics (Part 1): William Jennings Bryan to Barack Obama.” fivethirtyeight.com. January 14, 2016. Quoted in, “Political Campaigns Are Wasteful – So Turn Them into Startups.” Wired. October 28, 2015. Quoted in, “The GOP Has a Tech Talent Problem It Might Not Solve.” Wired. October 26, 2015. Quoted in, “With ‘$Cashtags,’ Twitter plays greater campaign finance role.” Reuters. September 16, 2015. Quoted in, “But How Does Bernie Sanders Win Ohio?” Boston Globe. August 21, 2015. Quoted in, “Eying 2016, GOP Embraces Digital Strategies, But Doubts Persist.” The New York Times. June 10, 2015. Quoted in, “Why Biden is (Almost) King of the Internet.” Washington Post. May 27, 2015. 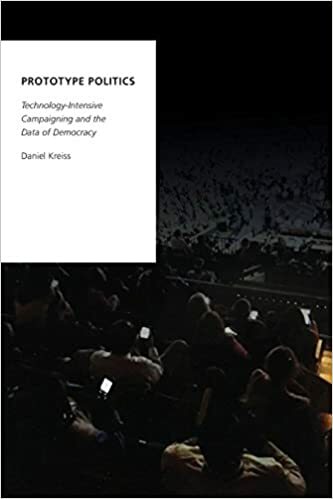 Authored piece, The Democratic Advantage in Digital, Data, and Analytics Isn’t Going Away Easily, Monkey Cage, The Washington Post, May 13, 2015. Quoted in, “It’s Not Who Follows Hillary Clinton, It’s How She Uses Them.” Scientific American. April 13, 2015. Quoted in, “Why Democrats Still Lead Republicans in Online Fund-Raising.” The New York Times. January 22, 2015. Research cited in, “The First Pop Quiz of 2015.” The New York Times. December 31, 2014. Quoted in, “Why Campaigns Won’t Stop Using Our Data: Because the Data Says we Like It.” Washington Post. December 18, 2014. Quoted in, “On Facebook, Nobody Knows You’re a Voter. Well, Almost Nobody.” The New York Times. September 10, 2014. Quoted in, “For Political Conventions, Another Balloon Bursts.” NPR All Things Considered. April 3, 2014. Quoted in, “Google Glass: Coming Soon to a Campaign Trail Near You.” NPR Morning Edition. March 17, 2014. Research cited in, “Change the World: Silicon Valley Transfers its Slogans – and its Money – to the Realm of Politics.” The New Yorker, May 27, 2013. Featured in, “Did Social Media Help Swing the Vote?” Wall Street Journal, November 7, 2012.